No repair is too small or too large! 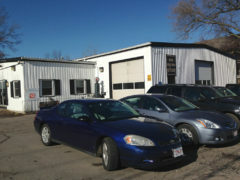 For over 40 years, Bob Graham Auto Sales & Service, Inc. is East Bridgewater’s premier gas or diesel vehicle repair shop. There is no job that is too small or too large for us to handle. With multiple repair bays and our highly-trained automotive technicians on staff, we can repair most any make or model. We offer reliable service for affordable prices. Bob Graham Auto Sales and Service is open 5 days a week for your convenience. Give us a call today to schedule an appointment. Bob Graham Auto Sales & Service, Inc. has state-of-the-art diagnostic tools that help us handle all of your check engine lights, tire pressure monitor lights and any other engine issues you may have. We use ALLDATA, for factory information on maintenance schedules and any recall your vehicle may have. WE ARE A REGISTERED REPAIR SHOP FOR GAS AND DIESEL (Repair Shop ID# RP060051).